Long after I closed this book for the night and lay waiting for sleep to catch up with me, I thought about what I’d read, about the ideas posed by the novel’s premise and characters, and the implications for my own life and our society. That’s a sign of a book that’s definitely worth reading. The story is set in the future on a distant planet, Urras, and its moon, Anarres. The culture on Urras is similar to ours: capitalist, competitive, with a huge gap between haves and have-nots. One hundred and fifty years ago in Urras’ history, a group of anarchists rebelled against this way of life. They settled on — or were exiled to, depending on your point of view — Anarres, a desert world where they built a subsistence society based on the premises of no government and no ownership of private property. Despite the difficulties of their environment, life on Anarres is like a simple Eden. No one goes hungry while others eat. No one goes without a sheltered place to sleep at night. People work and study at what they enjoy, travel where and when they want, and everyone communally shares the necessary but non-glamorous jobs. Without commercialism to occupy them, people spend their time working, learning and socializing. Even an eight-hour workday is considered unusually long. Of course, there are problems in this utopia, which have at their root the conflict between the continued survival of the society and the human drive to assert ourselves as individuals, to push the boundaries and explore new ideas. Without a government, Anarres is ruled by societal approval. Challenges to the status quo are unwelcome, and the challenger is often shunned. This is the situation that the main character, a physicist named Shevek, finds himself in. He is on the cutting edge of theoretical physics but unable to progress in a society that does not want his work. So he begins communicating with physicists on Urras, and becomes convinced that he needs to be the first Anarresti to travel back to Urras in order to shake up his own society and return them to their anarchist roots. The Dispossessed plays on the theme of time in many ways. The narrative is divided into two timelines: the present, when Shevek is living on Urras, contrasted with the Shevek’s past life on Anarres and growing discontent with his own society. Shevek’s physics are also concerned with time; applications of his theories could make possible faster-than-light space travel and instantaneous communication across space to other known worlds, including our Earth (called Terra). The four cultures of humans portrayed in the novel — Urras, Anarres, Terra and another planet called Hain — also represent four possible timelines of the human species. Urras is most like modern-day culture, if exaggerated; consumption, possessions and power are all highly valued. Terra’s future warns of the consequences of such excess, a planet made desert by the waste of previous generations, now trying only to survive. Contrasted with these outcomes are the alternate paths proposed by Hain and Anarres. We are not told much about Hain, only that it is a very advanced civilization, which helped save the Terrans. It seems only fitting that when Shevek finally returns to Anarres, the only person who wants to accompany him and learn from him is Hainish. This novel is rich and meaty, full of ideas and keen observations of human nature. Like the dusty plains of Anarres, it takes some time to get used to Le Guin’s dry writing style, which incorporates hard science and spare prose. But give it time and you will find many fascinating landscapes to explore. Ursula le Guin is lauded not only as an author who has been unashamed to admit to being a genre writer, but also as one who has pushed the limits of the genre as literature by dealing with serious themes in sfnal settings. The Dispossessed is a prime example of this, exploring as it does the ideological conflict between two opposing cultural and political hegemonies. Shevek is a theoretical physicist from the arid planet of Anarres, which is a satellite of the more verdant Urras. Anarres is home to an anarcho-syndicalist culture, created by a revolutionary splinter of Urras’ population a century and a half in the past. When their demands for freedom became untenable to the ‘propertarian’ governments, they were permitted to secede and colonise Anarres, whose only natural resources of any worth or note are deposits of metal ores that are in short supply on Urras. Thus Anarres became a sealed enclave; the only contact between the two planets are the spaceships that bring certain essentials in return for taking metals back to Urras. Shevek, an idealist, and a revolutionary among revolutionaries, has come to believe that some sort of mutual exchange between the cultures is not only possible but necessary. He sees his scientific discoveries as something that should be shared for the benefit all people, not just his own. On his homeworld, Shevek’s ideas are considered deeply inappropriate. Despite the lip-service paid by the Anarresti to the notion of freedom from constraint, their anarchism has become a rote tradition, stagnated and stultified by the powers of convention and consensus – by kowtowing to their nominal freedoms, they have locked themselves into a way of life that frowns upon any change or challenge to the status quo. Their revolutionary ideas have become dogmatic and unquestionable. Over the years, Shevek and his close friends work against this attitude, suffering from the contempt and anger of their fellow Anarresti. Eventually, having formed their own syndicate to lobby for the need for change and progress, Shevek volunteers to go to Urras, to exchange his scientific ideas and to act as a hand extended in good faith. Despite serious resistance to his actions, the lack of active enforcement on Anarres means he can go, leaving the world he was raised on for one that has always been in clear sight, yet also utterly out of reach. Urras is a world of nation-states, each operating a different flavour of government. Shevek is hosted by a university in A-Io, whose dominant mode is closest to the ostensibly democratic capitalism that is so familiar to Europe and North America. Shevek is, unsurprisingly, ill prepared to deal with the duplicity and power-plays that make up the day to day interactions between people on Urras; for all the flaws of syndicalist Anarres, it has nothing analogous to the iniquities that the private ownership of objects and ideas has produced on the richer planet. Idealistically striving to be an exemplar of his homeworld’s way of life, and at first blissfully ignorant of the extent to which he is being exploited through his own good will, Shevek ends up as a political playing piece, spied upon, mocked behind his back and shielded from seeing the dark underside of A-Io’s culture. Examining politics through storytelling is a risky business, and many books that do so end up stamped with a partisan patina of the author’s own attitudes. The triumph of The Dispossessed is its utter lack of bias to either side of the equation. 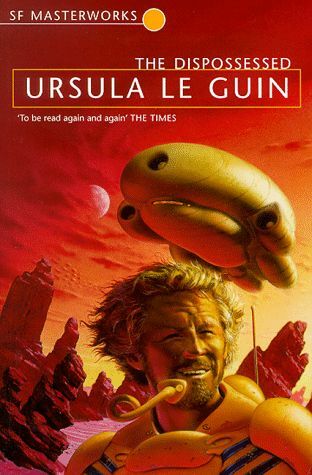 Far from idealising and glorifying the syndicalism of Anarres, le Guin is careful to show its flaws as well as its benefits – while arguably more free than the people of Urras, they live a hand-to-mouth existence that allows few luxuries and little development of technology or science that has no immediate practical value. While free of rigid hierarchies and class conflicts, their social system is poorly equipped to cope with natural disasters such as drought and famine, which turns their lives into a Benthamist struggle for survival. Likewise, Urras is depicted using this ‘warts and all’ approach. The institutional iniquities and inequalities of capitalism are present, but le Guin also shows the many benefits of such a system – art, science, variety, plenty and choice. Shevek himself is somewhat seduced by these cultural aspects during his early days on the planet, as well as by the beauty of a world with a plentiful biosphere, but due to his previous life in a world where the notion of property is anathema, circumscribed and stigmatised by doctrine, he cannot help but see the terrible consequences from an outsider’s perspective. Shevek is in many respects a perpetual exile – his ideals and intellectually aloof character mean that he is as out of place on the planet of his birth as he is on Urras, and as such he makes the perfect lens through which the reader can observe the two cultures. The differences between the two societies are carefully mirrored and enhanced by the relative differences between the planetary environments that host them. Urras is a verdant world, covered with agriculture that provides a variety of foodstuffs, whereas Anarres is an arid place with an attenuated biosphere. This means that a huge amount of manual labour is a necessity for Anarres to be able to feed itself – this subsistence economy ensures that the syndicalist culture isn’t portrayed as some simple utopia. Similarly, Urras is not painted as a world ravaged by rampant capitalism – indeed, with the exception of the working class slums it is described as a beautiful place, home to rich historical architecture and vast tracts of land where nature rules. There is further emphasis in the form of the interwoven narrative – alternate chapters, one following Shevek’s adventures on Urras, then one describing his former life on Anarres, juxtaposing the wildly different experiences of life under the two systems. Far more than just a simple story of ‘anarchy versus The System’, the outer framework of the ideological binary allows a great number of interrelated themes to be examined: this is a book about people living under ideologies, people as pawns of power; about the clash of idealism and realism; about the dichotomy between the word of the law and the spirit of the law; about hypocrisy and two-facedness; sacrifice and concession; defiance and repentance and the making of amends. Running right through the book from the first page to the last is a symbol that binds the whole tale together – the symbol of the wall, used to represent and evoke division at every level. The wall is not just the schism between Urras and Anarres and their respective political systems. It is also the division of convention, resistance to change; the division of property and ownership, and the barriers built between individuals; and the division of personal assumptions and comprehension, the walls we all build inside our own minds. To write a story examining this clash of ideologies would have been almost impossible without the sfnal conceit of the binary pair of planets; geographical separation alone could not have provided the isolation necessary to allow Anarres to exist as it is described. But although the central theme of the book is deeply political, it is far more than just a set of ideological comparisons, which would have made for a dull read even at the hands of an author of le Guin’s stature. Instead, The Dispossessed is a deep and passionate examination of human nature, both at the macro- and microcosmic scales. The characterisation is excellent; Shevek and his unconventional comrades are vividly portrayed, their foibles and flaws and the dramas that occur in their lives are described in intimate and touching language. The passages dealing with interpersonal relationships are some of the most moving prose a reader could hope to find in the entire canon of the English language. The Dispossessed is astonishingly rewarding, a powerful and moving novel whose themes will linger in the memory for a long time. Detailed but uncluttered, vast in scope but centred around a believable and sympathetic character’s efforts to change himself and the world around him, this book is everything that science fiction is frequently criticised for not being. The sfnal tropes and conceits, rather than being thrust into the foreground, are merely frames within which the story can be painted properly. The compassion and lack of vitriol make it a rarity among all books; the honesty of the storytelling and the avoidance of advocacy mean that The Dispossessed is still deeply relevant in today’s political climate, and will remain so for years to come – a crucial read for devotees of serious science fiction, and an excellent exemplar to give to science fiction’s most vocal critics. This review originally appeared on Velcro City Tourist Board.